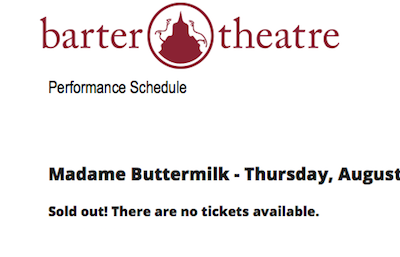 Madame Buttermilk played to sold out houses at Barter Theatre in 2018. Better get your tickets for the 2019 production now. Carly Speranza’s dream is to sing the title role in Carmen. Trouble is, despite her talent and her conservatory training, she can’t seem to land a role in anything. Then one day the phone call comes. 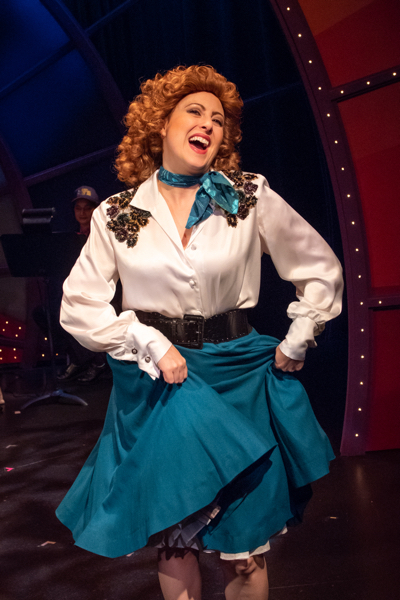 Mezzo-soprano—lost her voice—Carmen—performance tomorrow—can you come right away? It’s a dream come true! Until she is taken to a state fair to sing for a country music band called The Car Men. Her stage name is Pinto Packard. You know the Car Men, don’t you? Their song “Clutch Me” was a big hit down at the VFW Hall. Carly knows that if she breaks the contract, she will never be hired again. And if she goes through with the show, she will never be taken seriously. Madame Buttermilk is a family-friendly musical comedy with marvelous original music and truly funny dialogue. There are roles for 4 men and 4 women (one female role is non-singing). Musicians are onstage and have a few lines. The time is the present. The play is easily performed without a static set. Dancing can be very modest or as lively as you care to make it. The script is 128 pages; each act runs about an hour and twelve minutes. There are 20 songs plus a few reprises. 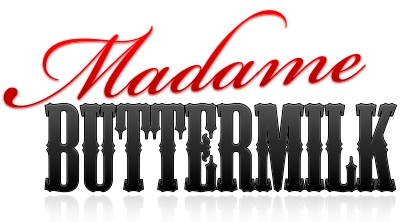 Madame Buttermilk is equally at home on a small stage with minimal set, and on a large stage with an elaborate set. You can run the show with just a few benches and a doorway, or you can try to outdo the 1500 light bulbs of a 2019 production. Here is Act 1 Scene 3. Carly has just arrived at a radio station for an interview before she is taken to the first rehearsal. She still thinks she is singing Carmen. Lights Up: Three chairs and a microphone. ART FLANAGAN, FORD, and CARLY enter. ART is cultured and urbane. One senses that he rues the fate that stuck him in the South instead of his native midtown Manhattan. CARLY wears a red shawl. ART And this is our little studio. Our radio station might be small, but we have a big audience. We’ll just sit around this microphone. Everybody comfortable? Are you ready? CARLY Yes, sir, Mr Flanagan. CARLY smiles pleasantly at FORD, who responds with a big grin. She becomes increasingly uncomfortable as his grin persists. ART OK guys, here we go. ARTS SHOWCASE FANFARE music. ART changes his voice to a smooth radio style. ART Well, a big good evening to our radio listeners and welcome to Arts Showcase with your host yours truly, Art Flanagan. Tonight on Arts Showcase we have two incredibly talented singers and performers. We have Miss Carly Speranza (Carly beams), professional opera soprano, who will be making a special appearance tomorrow night. And we also have Mr. Ford Fairlane, bandleader and singer for the top country music band in this region--I think we can safely say you’re the top band, can’t we Ford? FORD Well, that’s mighty nice of you, Art. I’m just happy to be part of the band that plays for the wonderful Miss Pinto Packard. ART Now tell us, Ford, a little about the band. Let’s start with the name. How did that come about? FORD Well, I had been singing and playing professionally for a few years under the name Ford Fairlane, and when my girlfriend started singing as Miss Pinto Packard I thought, hey, Ford and Packard, that’s two cars! So we decided right then that we’d start a band called the Car Men. ART And we’ve got a big night coming up for the Car Men. Tell us about it. FORD Well, of course, everybody knows and loves Earl Conway. FORD nods to CARLY, who is blank. ART Country music recording artist. In fact, one of country’s top stars, wouldn’t you agree? FORD He’s breaking records right and left! I mean, not breaking records, but, you know. Now, Earl Conway is going to perform at the state fair this year. And we--that is, Pinto Packard and the Car Men--are going to be the opening act. ART That’s quite a break for your band. FORD That’s right, Art, this is the biggest show we’ve ever done. They’re expecting a record crowd. People will be coming from all over to hear Earl Conway. We’re totally excited and honored to be chosen to open the show for him. ART And when is the big show? CARLY squirms in her chair. During the following dialogue between Art and Ford, CARLY’s emotions, written on her face, progress from suspicion to fear to anguish to blind rage. ART Tomorrow night at the state fair, opening act for Earl Conway, Pinto Packard and the Car Men. Now your fans are going to see something different tomorrow night, aren’t they? FORD Yeah, Dody had to have some emergency surgery this week and it has affected her singing voice. ART I’m sorry to hear that. I hope it wasn’t too serious. FORD It was just a tonsillectomy. Of course it means she can’t sing for a while. Or talk, even. ART So you had to find a replacement. FORD --and none of them worked out. Then somebody recommended a young lady who’s going to work out real well for us. She’s sung at the Grand Ole Opry! FORD Not only that, she already knows all the Car Men songs! ART Well, let’s meet her now. Carly Speranza, appearing at the state fair as Miss Pinto Packard! ART Let me start with your name. Carly. Now that’s a perfect name for the Car Men, isn’t it? Is Carly your real name? FORD Car Lot--. Hey! I couldn’t have come up with anything better myself! CARLY Excuse me, Art, do you have a five-second bleep filter? ART Yes we do, why? FORD leaps to cover CARLY’s mouth, while ART leaps to cover the microphone. Lights fade.